Birds of Prey seems to be one of DC’s overlooked gems. Looking back through previous reviews, it seems to maintain a higher level of consistent quality than other titles. 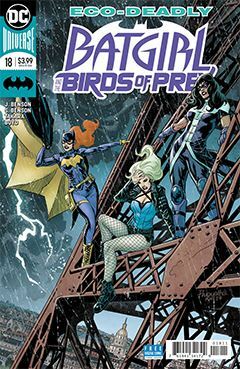 While perhaps not as high-profile as other properties, the Birds of Prey seem to fly under the radar, delivering the kind of entertainment I look for in my comic book reading. In this issue, Spyral recruits Huntress to look into the dealings of Zin Bast, an international arms merchant. She agrees, on the condition that she works with her, team, not Spyral. Bast is schedule to attend an international energy conference in Paris, and the Birds are all too happy to be there. What follows is espionage chaos, kidnappings, secret weapons, and stolen super-villain tech. Takara’s artwork works very well, with bold inking that conveys a certain amount of “film noir” atmosphere, perfect for a spy caper story. There may have a been a few moments where it appeared to get a little sloppy, but it was always in the middle of action, so I chalk it up to an artistic choice, conveying the chaos of the moment. It’s a very entertaining story, with lots of car chases, fights and other action. The Bensons seem to have decided, “Let’s get back to basics.” There is not a lot of needless exposition or characterization. We know who the Birds are, they know themselves and each other. It’s a tight little narrative that simply tells a good story, a pleasant palette cleanser amidst all the over-hyped events. More comics should do so well.